Perhentian Island or Pulau Perhentian - Lying just 18 kilometre from Jertih Terengganu and 60 from Kota Bharu Kelantan in Peninsular Malaysia. 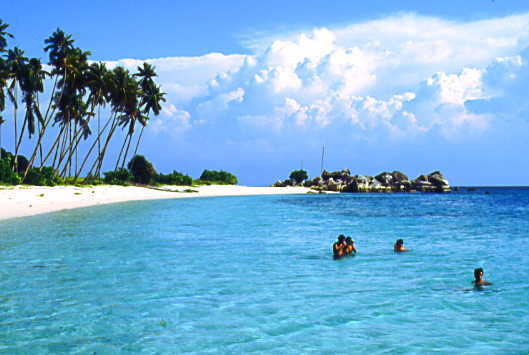 This beautiful island is famous among travelers for its soft sandy beaches and laid back lifestyle. Perhentian Island is accessible from the small fishing port of Kuala Besut, 25 minutes by speed boat or a leisurely 90 minute sea journey by colorful traditional boat. The two jewels located 45 min away by boat from the Est seaside of North of Malaysia. As a consequence, it is in the China Sea we can swiw there. These two twin islands are a part of Terrenganu State, but we have to cross Kelantan State to reach them, which is located at the extreme North of Malaysia, and has a borderline with Thailand. This State, as his neighbour State, is a rigorist islamic State, where for instance the law forbid alcohols. The islands have a number of activities on its beaches and forests, with the most popular being snorkeling and scuba diving. The more relaxing pursuits are sunbathing and swimming and, apart from these, the island also offers activities like canoeing, jungle trekking, fishing and island hopping. Owing to the islands' protected status, the main tourist activities have minimal environmental impact. 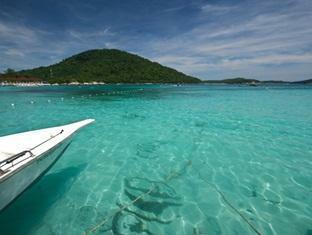 This makes Pulau Perhentian famous in the region for its stunning preserved natural world and diverse marine life. The monsoon season peaks between November and March every year. You can expect more rain and rough seas and most resorts are typically closed from end October through end-February. Peak season is between July and August and prices rise accordingly. During off-peak times, rates are negotiable. You may need to book well in advance during peak time and also for public holidays and weekends. Note that most budget resorts do not accept bookings and handle guests on a walk-in basis only.